Well the rolling chassis is home for Christmas, and I think it looks awesome!! There's still a few minor jobs to completely finish the front end, but they can wait until next year and after an Engineer has inspected the roller and given me direction on how we achieve all the modification permits I need to apply for. The front wheel and brakes are still undecided, and the one shown is purely for mock-up and so we can push the chassis around and take measurements. Now that it's sitting on wheels I can confirm that we exceed the 550mm for the front end/axle by 2 inches, so lots of work to get us to the next stage. Definitely tucked up in the air. Is a lovely looking girder though. Pity the pivots on the trees are set so far forwards of the headstem. A lot of girders had the bottom pivot level with the centre of the headstem with the top one forwards to keep the axle back... in the interests of sufficient trail, but also helps with Ridikulus550Rool. In SA I believe that if an engineer can demostrate that the purpose of the R550R (supposedly to reduce strain on the neck area, although they never did state its purpose) is addressed in your modifications, it can be passed if it exceeds the 550. I guess that means some extra gusseting and reinforcement to the backbone and the engineer claiming the mods exceed strength requirements. You might be able to take that approach in WA. Gotta agree with you, That does look awesome! I notice that you have the P&P girder in the +10 degree rake position - is this when you are over the 'Ridicule Rule'? What if you pull in the bottom to the zero rake position? That will put the front of the bike up a bit more, but will it fit the 550ridiculerule? If so, perhaps it's just a matter of extending the front down tube, without altering the rake or the top tube, to drop the engine lower- I think we know who can help with that rather easily. That's exactly what I'll be doing as the next step, setting the girder up in the zero rake position. With the girder in the +10 degree position I end up with negative trail at any rake angle that fits within the 550mm rule. If I swap to the zero degree position I believe we can achieve positive trail even if only a couple of inches, providing we rake the frame as much as we can to put the axle near on the 550mm limit. I haven't tested this theory exactly yet, but some brief eyeballing tells me it should work. 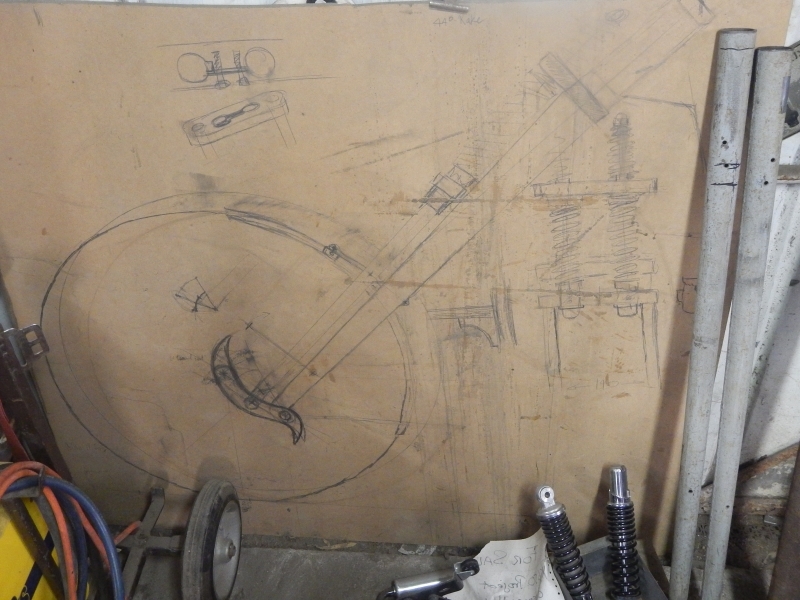 When I get some time over the next couple of months I'll do some more exacting mockups to prove this and come up with all the exact figures I need to present to the Engineer regarding rake, trail and how much I want to stretch the frame. I really wanted to avoid adding rake to this frame, but it looks like there's going to be no way around it in order to get this front end to work, and to have a safe and stable bike to ride. A simple solution could be to turn the head stem with bottom triple tree 180 degrees which will pull the axle back (at a guess with out measuring off the photo) 5-6 inches. Then rake the steering head enough to just meet 550mm. This should give you plenty of trail... and get your chopper level. At a guess, you would still have sufficient lock... and the more the better. If this does not work out measurement wise I would be moving the bottom rocker arm mount back on the steering head to get the correct geometry. Get a large piece of ply or particle board and measure off your set up 1:1 and see what you will end up with. That is the simplest way. 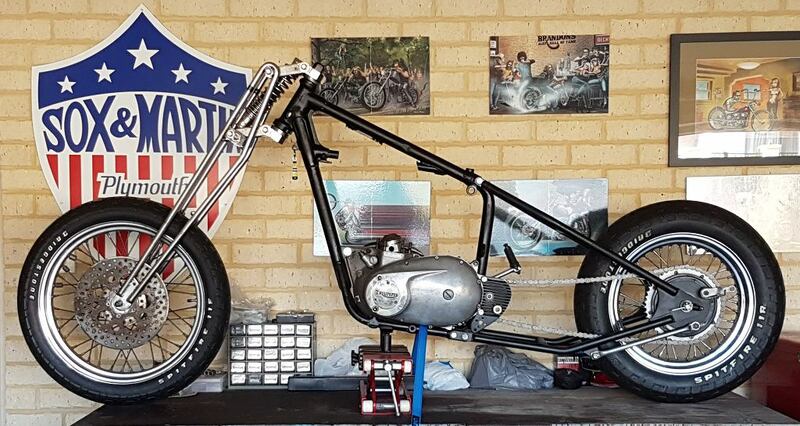 When you put weight on the chopper remember that the forks and therefore axle will move forwards as the frame sinks an inch under the weight. 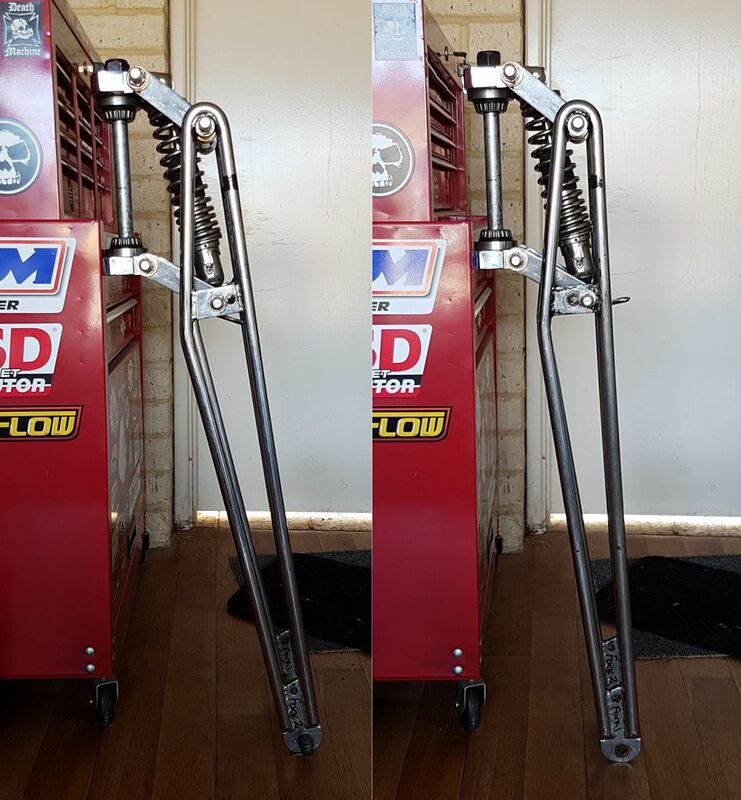 A customer has found a girder for his XS and the spring on it does not move more than a few mm when he takes the chopper off the jack. He needs to get a lighter spring made. If the chopper does not drop an inch under the bikes weight, it will be way too harsh a ride. Not sure what trail you have ridden with, but my shovel (heavy bike) runs about 9" I think and that is perfect for the bike. Paul's 550 trail is an inch or so more and also beautiful to ride. 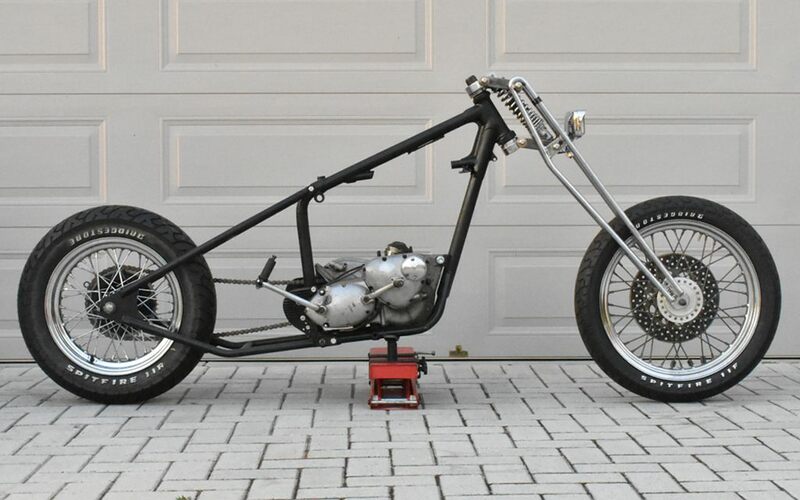 Steering is a bit heavy when wheeling the chopper around the shed but I can ride no hands down to 25mph and pull up at the lights with one hand on the pullbacks. What I am saying don't be afraid of trail... gives you a self steering bike and very relaxing to ride, beautiful in the corners too. I finally had some time to play in the shed today, and got stuck into the front end. After realising that with the front end bolted together in the +10 degrees rake position I was going to be well over the 550mm ADR rule (50mm too much), and end up with negative trail, I stripped the front end apart and put it back together in the 0 degrees rake position. You can see below visually just how much of a difference this makes. +10 degrees on the left, and 0 degrees on the right. 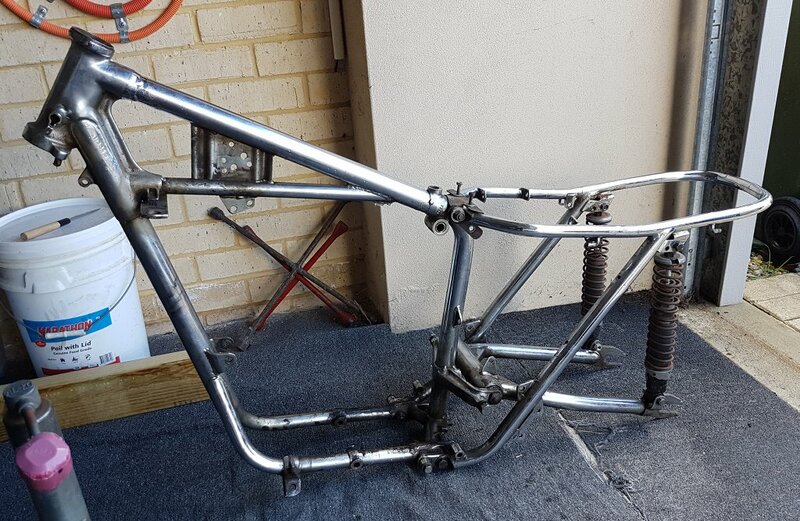 Once I put the front end back in the frame, as expected the front axle did come a fair way back towards the neck, plus this pushed the front of the bike up even higher and therefore increased the effective rake at the neck. But visually it still looks great to me. So what is the end result? Bloody good news!!! The horizontal distance between the front axle and a line dropped from the centre of the neck, now measures exactly 550mm, which is bang on the legal limit. The trail is now positive and comes in at 3", which is well within recommended guidelines for a bike like this. So as you see it sitting below, the roller now meets legal limits, and should have acceptable safe handling and low and higher speeds. The concept of fitting this front end to this bike has now in mind been proven, so I'm stoked!! That looks great in the zero-rake position! Good to hear it meets the silly regs too. 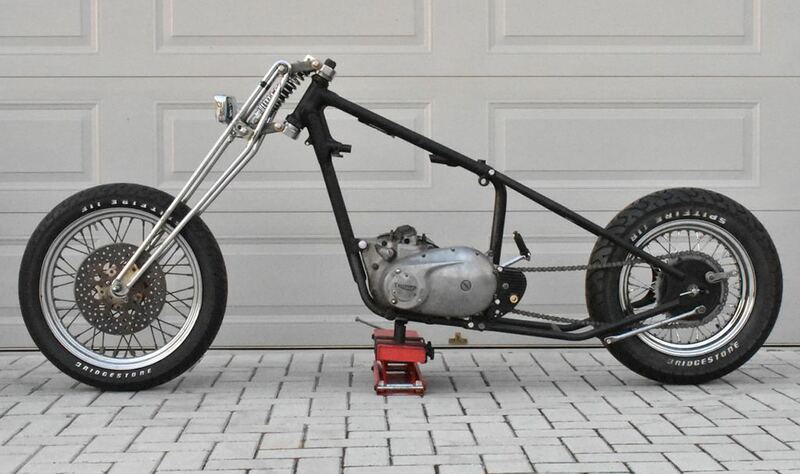 Been thinking about an option for your machine...well a couple more; one could be as I mentioned before - leave the frame neck where it is - no change in rake and still tied to the backbone as original, and just stretch the front single frame downtube to get the engine lower to the ground, which will help with center of gravity issues. Another option to lower it, is to find a shock which is an inch or so shorter...and another I looked at is to re-position the axle to to the holes intended for the brake stays - keep the top of those holes in the same place and enlarge them to 5/8" lower (offset from existing holes); looks like it would lower the front end about 2 inches and not require any welding to modify that - just slip the legs off, back to the machine shop and boom, 20 minutes later, done; however, this will require a few fancy spacers to fit against the flat of the plates and relieved to fit around the round sections - but doable... but then you will still need a brake mount location...perhaps that could be a weld-on tab at the back of one leg...or one of the 'former' axle holes. to keep a straight line from steering head to rear axle, you could lengthen both the front down tube and the seat post. Remember that once there is weight on the bike and the girder arms move upwards they will also push the axle outwards. Getting there though. Thanks guys, and you're both pretty much on the money with where I want to go to next. The position of the neck in terms of height from the ground and the angle of rake will need to remain pretty much where it is, or maybe a degree or so less rake just to make sure we absolutely 100% do come in just under 550mm. But the plan is to chop the frame, to extend the down tube and the seat post/backbone. Obviously consulting with an Engineer and obtaining modification permits are needed from the Transport department, but I feel so happy that a proof of concept is coming together at last. Those Triumph frames are way over engineered, which is why they out handled jap bikes and made the jappers look like their frames were made of spaghetti!! Sorry for a lack of updates, but not much has been happening lately as life has got in the way. But... I do have a meeting with a Department of Transport approved Engineer this week to discuss the project and help with the paperwork needed to apply for all the modification permits I need, so I'm looking forward to that! 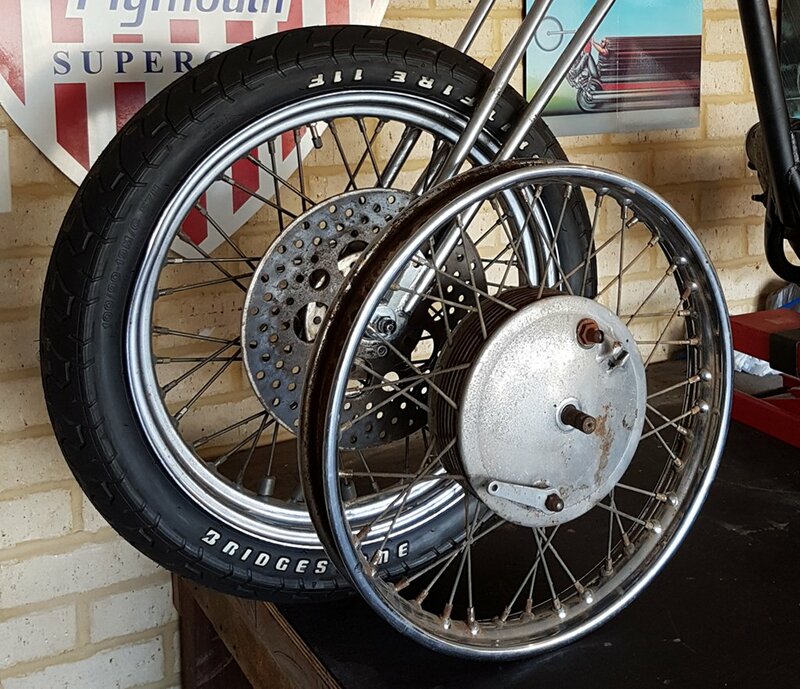 I also had a bit of score on the weekend and managed to find in the local classifieds an original Triumph drum brake front wheel, which we'll clean up and restore and probably use this in place of the mock-up Sportster wheel I have in there now. 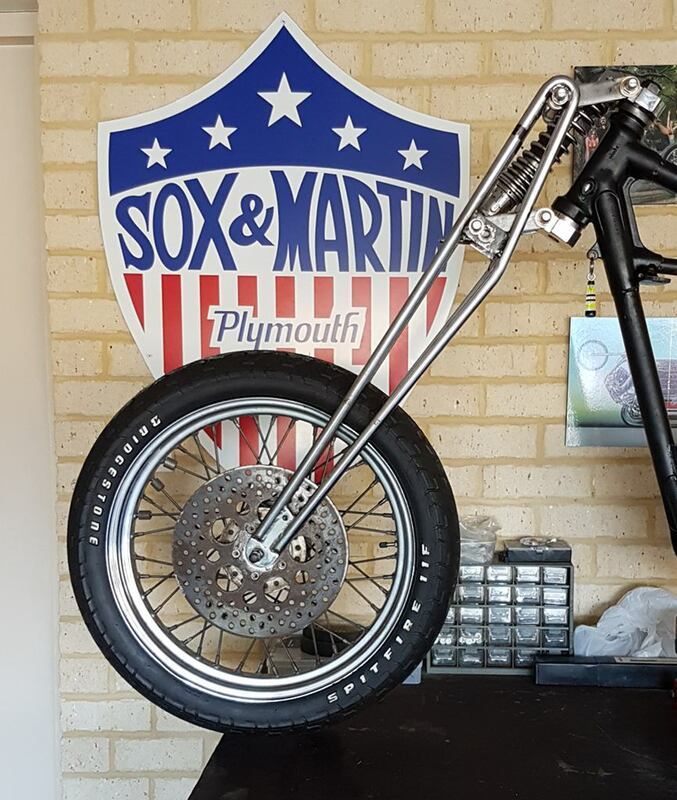 Yes I'd prefer the stopping power of a disk brake, but the Triumph drum wheel will mean I have period correct stock brakes for this frame front and back, and therefore should not need any Engineer approvals for brakes. 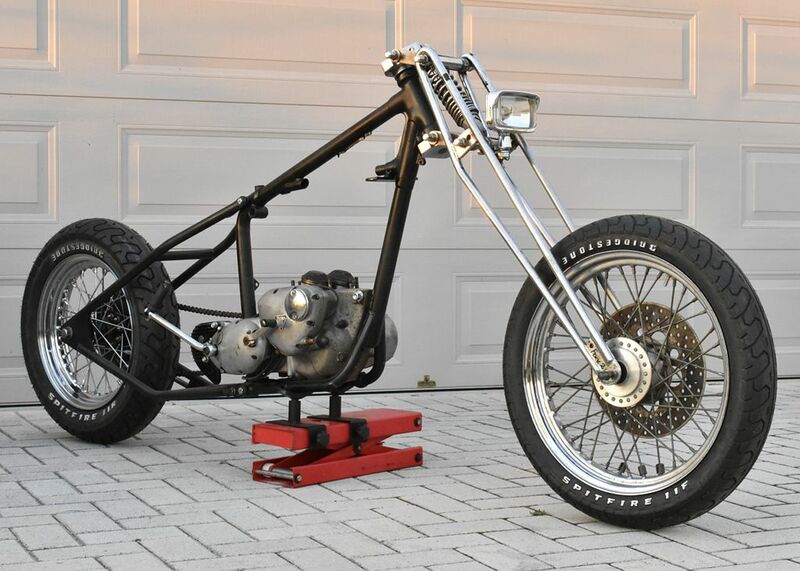 Mounting the drum front wheel should be cleaner in the girder front end as we should be able to make a brake stay that can pick up from the existing mounts on the front axle plates, rather than having to weld on extra tabs to the legs to mount a disk brake caliper. As part of the package deal of parts I picked up on the weekend, I also scored a stock hydraulic front end (albeit missing a few parts and needing a full rebuild), so that will go up for sale shortly. The real score, was another Triumph frame!! This one a 1964 Triumph Thunderbird, with all paperwork, certificates and history required for rego. 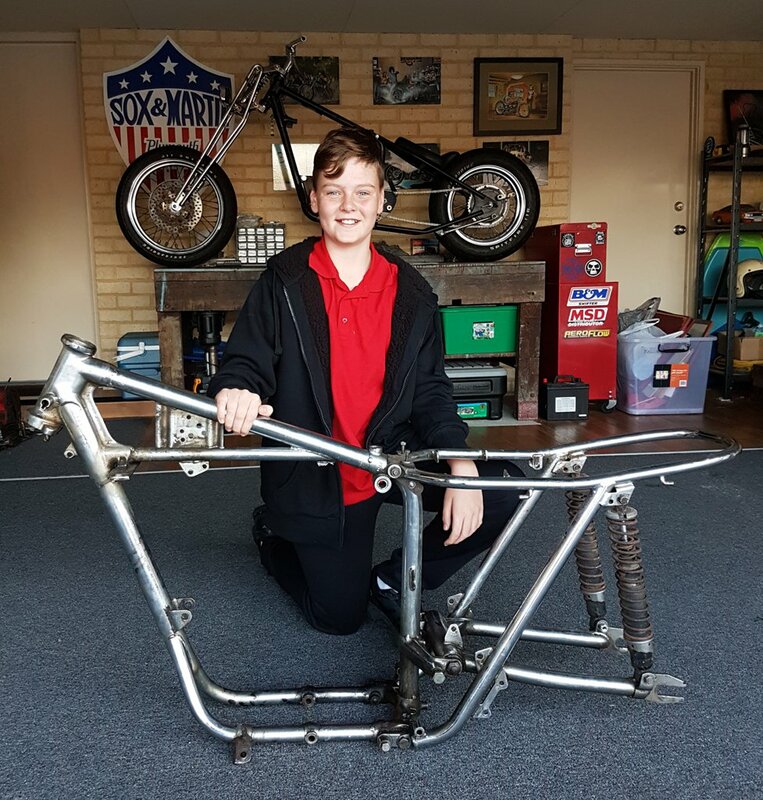 This one will now become my 12 year old son's bike, and give us a Father-Son project, building a second chopper out of this one, although a lot milder in design to what I'm doing. Be interesting to know how good the Trumpy drums are. Pity its not a twin leader, though it could be converted. Son looks happy and will be a great experience for him. Good to have young lads who know how to wrench and actually be useful rather than just play computer games!